"Avail yourself of the grace of God as you strive for a higher degree of Christian perfection." What else is there to say? It's the simplest thing, but it can be very difficult. Grace is there for us; the sense that grace has to be squeezed out of a stingy God is an optical illusion of the spirit, deriving from the confusion and distraction of our minds. Grace is there for the taking, or better, is there trying to make a home in us in God's passion to relieve us of the burden of our misery, our self-absorption, and the dullness and frustration of our sins. It is God's delight to replace the boredom and sadness of sin with a flourishing and creative holiness; all we have to do is consent and surrender. This is the whole of the spiritual life; simple, and yet a long and treacherous journey. It reminds me of one of my favorite sayings from one of my teachers: "Grace is free, but it's not cheap." It's the amazing of faith of ordinary people that nourishes you in the parish ministry. It is such a strong encouragement and such an honor to give it reverence that sometimes I almost feel bad for those who don't have this in their daily lives, especially priests. Today has been a good example. At Mass this morning I noticed the mother of one of the first brides I worked with here at the parish. After Mass I asked her how the newly married were doing. As it turned out, they had recently suffered through the death of their first child, who was only five months old. They had planned a fundraiser for the rare disease he had, but the baby died before it was held. They went ahead with the event anyway, and raised a lot of money for research. As the mother related it to me, their baby's death--even in the intensity of their grief--would be redeemed as an opportunity for increasing awareness of his disease and raising money to find a cure. By our baptism we are baptized into the death and Resurrection of Christ, and by our Holy Communion that same Body of Christ, broken, sacrificed, and raised, embeds Himself in our lives. The faith of these folks is an example of how the paschal mystery comes to be incarnate in the world: the mystery of Christ by which death, robbed of its power, is transformed to life. When people ask me about what I have found to be most challenging in the parish ministry, I usually tell them that it's the hours. Not that the work is overwhelming by volume--it more often overwhelms by variety--but that it is arranged in ways I had to get used to. The parish priesthood is often a kind of bi-phasic work; the most intense parts of the day are the early morning and the evening. Regular Masses and funerals fill up the mornings, while the evenings are spent in committee meetings, pastoral counseling, parish council, marriage preparation, RCIA, etc. As I continue in my transitional moment, most of the evening stuff has come to an end. All of my couples are married, my catechumens initiated. I have terminated with those folks with whom I had been meeting for spiritual direction. The Parish Council and its committees are in summer recess. And so I find myself at six or six-thirty these days, looking out upon empty evenings for the first time in years. It's a little jarring. I've started to walk the parish boundaries during this time, trying to simply pray in gratitude for the faith and goodness of the people. There's an emptiness, a sort of grief in it, a little death as everything quiets down to silence. But silence is always an invitation to contemplation, and I try to see my retreat from full-time ministry in this light. To get reacquainted with the emptiness and silence at the Heart of it all. As I am called to move on, may I be grateful for what has been and be able to let go in peace. Last Friday I had an invitation to offer Mass at the shrine of Mother Cabrini in Manhattan. Offering the Eucharist on the altar that contains her remains was an intense experience. Check out a picture of the altar here. It was one of those experiences that made me remember the advice of one of my mentors on the morning of my ordination day: "Remember the Communion of Saints. It's the only way this makes sense." As I pronounced the words of consecration over the bread, I heard more voices than usual. Of course I heard the Lord's words in my voice as I formed my intention of consecrate, but I also became conscious of a more manifold speech at that moment. I was standing, according to rubrics, parum inclinatus, so I was looking down not only at the host but in the direction of the saint's remains. I heard the voice of the Lord speaking also of her. This is my Body, which will be given up for you. That was her sanctity, to become the presence and salvation of Christ to so many. But I also heard my own voice speaking in this way about Mother Cabrini's body, as if to say proudly, this is my body, too. In our communion in Christ, my life and my body are only an insiginifant member of the Body of Christ that is the Catholic Church--the Church which is catholic and universal first of all because it is one with the Church in heaven. This is the salvation Jesus accomplishes by extending his own sacrifice to us and embedding it within us through the Mass. His Heart is opened on the Cross so that we might find our way in, and become members of one another in Christ, living as his risen Body, risen to the Father but still present on earth in the Spirit. Our freedom in Christ is worth our attention from time to time, both because of the errors of the flesh and the world, and because it is the means by which we fulfill the commandment to love our neighbor. Follow this link for my homily for this weekend. The other day I spent some time with an older parish couple who love to recount all of their travels and adventures. To hear them speak, it seems like everyone they ever met was the most wonderful person ever and everywhere they went the most delightful. It raises a spiritual question for me. Why is it that some people go through life sustained by the happiness of making friends with all kinds of people who are interesting, thoughtful, and a joy to meet and get to know, while other people go through the world finding other people to be annoying, aggravating, and difficult to live or work with? Are they meeting totally different sets of people? I doubt it. The difference is not in others, but in ourselves. More and more I realize that our day-to-day spiritual health and peace depends a good deal on how we consider and relate to other people. In order to achieve the happiness of being the kind of person who finds others to be enjoyable and interesting, a twofold ascesis is required. First, I must train my thoughts to look upon the best parts of others, considering their goodness before anything else. Second, by my speech and action, I must be a peaceful presence to them, a good influence, and someone who brings out their better qualities. The name of this ascesis is charity. When we find the person who is able to do the same thing for us, it is called friendship. One must be grateful for the graces that serve to humiliate us by dismantling our pious illusions about ourselves. Humility is impossible without honesty about our spiritual condition. This morning has been a fine example for me. Among the most challenging chores of my current transition are figuring out my health coverage, finding a new physician, and figuring out how I will get the prescriptions I need. I have asthma, and have had it for a long time. Over the years I have seen the drugs improve tremendously; at this point I hardly ever experience symptoms, but I know I need my daily doses of medicine. I am grateful to have had some kind of health coverage throughout my adult life thus far, but it has always been in some sketchy or incomplete way. I have always been able to see doctors, eventually, and to get what I need, but not without a lot of struggle and torturous explanations. This has been so both in and out of religious life. For the last few years I have had it pretty easy, both because my community has made some great improvements in how us younger brothers are covered, and because I live next to our retirement residence and thus have easy contact with doctors. But things change in the itinerant life, and now I have to figure out how things will work in my return to student life. Various people tell me entirely different things, and of course I get anxious about how I will be able to make sure I can keep breathing. So I find myself this morning, already having lost an hour on account of trying to puzzle some of this out and fretting about it. That's a good hour of a Thursday morning, the time I usually try to use to draft my Sunday homily. But then, thanks be to God, I'm able to surrender to the grace of confessing my arrogance. Is this not one of the standard anxieties of the poor? This is what poverty is in this world; to have difficult access to those who control the resources that are life's necessities, or to be excluded from them altogether. I will never really know such poverty, but if I claim to be a poor man by my vows, should I not be grateful for this little taste? Whatever part of me feels annoyed by all this, as if I--in my being a North American male from one of the privileged classes--resent having to deal with such things at all, it reveals that I am not entirely converted to the life of evangelical poverty. But I'm grateful for the grace this morning of being invited to surrender to this taste of the anxiety of the poor; may it make me compassionate and drive me to bring the good news of the Kingdom of God to the real poor of my neighborhood and world. Our Capuchin Constitutions have a wonderful line on all this, which I think is derived from St. Bernard: "Let us not wish to be numbered among those who go by the fictitious name of 'poor' who love to be poor in such a way as to lack nothing." Amen. Are You Here For Supper? People who enter religious life tend to be sorts that are sensitive to symbol. This is certainly as it should be for our life and work. But this also means--in ways that are sometimes both amusing and exasperating--that the most simple, transactional elements of our common life can be invested with great meaning, even to becoming treated as grave and mortal questions complete with their own zealots. One example of this is the sheet of paper for signing in or out for supper, which you will find posted somewhere near the kitchen of most religious houses. It is usually presented as a sort of grid, with the date on one axis and the members of the community on the other. Marks are made on particular coordinates to indicate presence or absence from supper. This way whoever is cooking has an idea of how many to prepare for, and for whom. Here we arrive at an ancient and acrimonious debate. What is the default, unmarked position? In or out? In other words, should brothers have to sign out to indicate their absence from the common table, or sign in to indicate that they will be there? Is it a 'sign in' sheet or a 'sign out' sheet? Those who argue for the 'sign out' model say that any religious house in which absence from the common table is the default norm--at least symbolically if not necessarily--cannot possibly be healthy. Absence from the brothers ought to be an exception. Even if one is absent more than present, it is still the exception in the larger spiritual and symbolic economy. They fear that the 'sign in' model presents a worldview in which fraternal life is an elective rather than something to which we have consecrated ourselves by obedience. On the other side, those who argue for the 'sign in' model say that is far more practical, and produces a better estimate of how many will be present for a particular meal. Therefore, those who cook a lot sometimes favor this model. Even more, the brothers are notorious for forgetting to sign out and often overestimate others' awareness of the obligations and days off that sometimes absent them from table, which others are supposed to know automatically, e.g. 'Everyone knows I'm never here for supper on the third Wednesday of every other month.' Nobody pays you that much attention, I'm afraid. God, perhaps. In this broken world, the desire to ensure that you get something for supper is a more powerful reminder than fraternal concern and charity for the cook, and so it is easier to remember to sign in to indicate presence than to sign out when indicating absence. Or so goes the argument. Proponents of this position also point out that guests always have to be signed in, even when regular members have to make a mark when they are in the opposite condition of absence, leading to a nomenclaturally incoherent system that would be easily resolved if everyone, guests and regulars, had to sign in. No doubt this debate will rage in religious life until we all find ourselves at the heavenly banquet. In preaching at a baptism, wake, funeral, or wedding, or to a particular group like religious or children, you can speak to a specific spiritual condition or state in life. Not so on Sundays; at the Sunday Eucharist we are all together, all degrees of devotion and all states of life are present. Sunday preaching is more of a challenge for precisely this reason; one must preach to all at once, but without being vague. This also means that if you preach to a few hundred people each weekend, there are bound to be folks who decide you are the best preacher ever. So they will be your encouragement. You just have to embrace the ascesis of not preaching to them alone. On Saturday our newest priest was ordained by our Capuchin brother Cardinal Sean O'Malley, archbishop of Boston. The homiletic instruction he gave to the ordinandus (and by extension to all priests present) was quite inspiring, and I wanted to share two points that I can recall. The first is on spiritual fatherhood and the second on pronouncing the words of consecration. As a spiritual father to the people to whom he is given in service, as well as one called to beget new and renewed children in Christ, the priest should take as his example the self-sacrificial attitude of the earthly fathers he meets. Fathers make great sacrifices for their children, and go to great lengths for their good and advancement, and so it needs to be for those who are called to fatherhood in the spiritual order. To pronounce the words of consecration--or better, to have them spoken by the Lord through us--is the center of each day for the priest. To do so with sacramental validity (that is to say to do so according to the rubrics and to mean to consecrate as the Church understands it) is only the beginning. The words of consecration only come to their full meaning for the priest when he includes himself in them. When he says, "this is my body, which will be given up for you," the priest is also conscious that is offering his own life and body to be broken and given up for the sake of the people of God. He speaks these words in persona Christi, but this also means that he offers his own life on the altar, uniting himself each day to the one sacrifice of Christ. The picture below is blurry, but not so blurry as to leave any doubt that it is me who is laying hands on the new priest. I have found this particular act and moment to be one of the greatest joys of the spiritual fatherhood of the priesthood. Our new priest, who is to be my successor here at the parish, was the fifth for whom I had this privilege. By our contemplation of Christ crucified, we receive the Spirit that is handed over to us by his Passion. Follow this link for my homily for this weekend. Well, today I'm off on a short but packed road trip. Highlights include my mother's retirement party, the priestly ordination of my successor in the parochial vicariate here at Sacred Heart, and a couple of other errands which have become opportune at this moment. Watch the Twitter feed at right for locations, updates, and reports of maladventures. In your charity offer a prayer for our ordinandus and for my mom as she begins her retirement. Today I have noticed something interesting in my 2002 Missale Romanum. 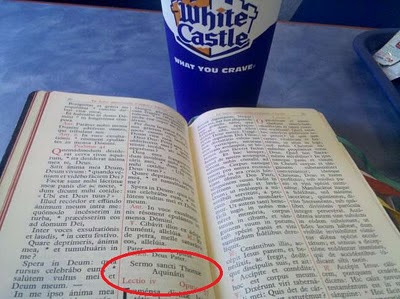 Amid the formularies for missae et orationes pro variis necessitatibus vel ad diversa, called in English, "Mass for various needs and occasions," there is a Mass that seems to have been omitted in our current edition of the American English Sacramentary. The American English Sacramentary seems to skip this one; it goes right from "For Forgiveness of Sins" to "For Charity." So...a couple of questions arise...is this Mass formularly new in the 2002 Missale Romanum, or did it exist previously but was omitted in the English language editions? Will it be included in the new one when it appears? Or have we been denied the Mass for praying for continence all this time? Would it not have been a good idea for some priests to have had this Mass available to them? 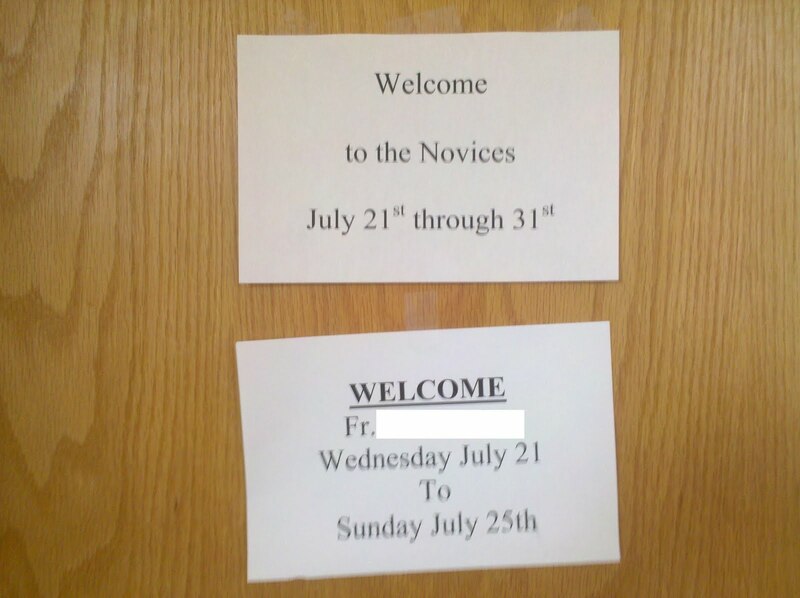 I'm going to feel very uprooted as I transition out of the parish ministry. Most of all, I'm going to miss the people. Never before have I had the experience of being embedded into a community, of having so many personal connections with people. Here's my mechanic; I buried his father. Here's the manager of the local pizza place; I did his wedding. Here's my friend the local cop; I prayed with her when her little brother was murdered. Here's one the local guys hanging out sketchily on the corner; I remind him of his deceased mother's concern for him. The other night I walked the parish boundaries after supper, just trying to offer my intention of gratitude to God for the people. I run into some parish kids going into a restaurant with their mother. Then I get introduced to a dog named Simon by two parish ladies taking a walk. As I go by the local park, some of the altar girls recognize me and interrupt their softball practice to say hi. I guess I've lived a fairly anonymous life up until now; never before have I felt like such a "public person" and a member of a community. It's a very supporting thing. One of the most striking aspects of this experience of parish ministry is that both the headaches and the support have been far more intense than anything I had experienced previously. There are three other apostolic churches within the square mile of our parish territory: Melkite Catholic, Ukrainian Catholic, and Russian Orthodox. I'm going to miss that too. In the winter, when the leaves are gone, there is a spot you can stand on our street and see at least a bit of all four churches. So there's a certain richness to the Christianity and the Catholicism of the neighborhood. I'm grateful for that. A couple of apologies are in order. First, for some reason your comments have been falling afoul of the spam filter all of a sudden. That's why they didn't get published yesterday. Second, though our problem of timing out when trying to connect to Google services seems to be fixed for now, I am not convinced that it is entirely resolved. So this could still lead to slow posting and comment publishing. It's a fragile world we live and work in, and we are fragile within it. For us Capuchins today is the feast of those five of our brothers beatified among the martyrs of the Nazi persecution. Five years ago, this day was the occasion of one of the most remarkable experiences of my whole religious life. Check it out here. Offering Mass on the days of martyrs becomes increasingly striking for me. Somehow it all comes together in a particularly vivid way. The Mass begins and ends with my kissing some martyr's relics in the altar. Jesus offers his broken body to the Father, a single and perfect sacrifice which the Mass extends through time and space. We receive the broken Body and the Precious Blood into our bodies, that we might not despair in the brokenness of selfishness and sin, but have it transformed into the brokenness of compassion and humility. We are all victims of the violence and selfishness of this world. It beats on us from without and lives within us as the still-healing wound left by original sin. To be a Christian, to confess Christ crucified as the salvation of the world, means to receive this evil in such a way as to refuse to pass it on to others. To be the broken body of Christ we proclaim ourselves to be at Mass means accepting the martyrdom of making ourselves into last stops for the cycles of violence of this world. Just as deep wisdom can come ex ore infantium, it can also come similarly from those suffering from dementia in old age. Really needing a little quiet time, I went out for a walk after supper tonight. I watched some kid go from second to third on a passed ball as I walked by the park. I stopped by the funeral home to see if there was anyone to pray for, but it was deserted. I'll be back there again, at least once. When I got home, I received a message that one of the older friars was looking for me. Such a thing is usually a telephony or voicemail trouble, so off I went to his room. It turned out to be a concern that I "would take the Mass in the morning" because Father wasn't feeling well. I told him I would certainly take the Mass, which was true, even though Father hasn't had to worry about such things in many years. "Yeah, I hate it too when I get petty." "I know! I also get anxious when I'm having trouble accepting differences." This weekend we have a guest preacher to make the annual appeal for the Propagation of the Faith, so I have the weekend off from preaching. It's kind of a bummer, because the dinner scene in the house of the Simon the Pharisee is so beautiful. Jesus reminds us that to know ourselves as forgiven will be the source of our love of God. Our choice is not whether or not to be a sinner. Our choice is what kind of sinner we want to be; we can allow our selfishness and sin to harden us into bitterness and idiosyncrasy, making ourselves unhappy and everyone around us miserable in the process, or we can allow our consciousness of ourselves as forgiven sinners to soften us and make us grateful for God's love. As Catholics we sometimes get into a kind of angelism that injures our ability to experience this. The process goes like this: we go to confession, make a fresh start, and are happy because we are free from sin, a good and godly person. Then, after we sin again, the second temptation sets in, inviting us to despair for our Christian life and virtue, and telling us that we have ruined everything. There is no point in praying because we are ashamed of ourselves before God, and we may as well just give in to sin because we have already ruined our perfect little self. This second temptation reveals the trouble: mixed in with our love of God is a little bit of selfish vainglory; part of us wants to worship ourselves as an excellent and devout soul. Instead of leading us into the shame that makes us want to hide from God and the frustration at not yet being the saint we want to be, we must allow our sinfulness to make us love the forgiving God all the more. Far from making us forget about prayer and letting our vigilance go, this will push us to prayer. When we love someone, we seek out time to be with that person. So it is with God. Instead of getting down on ourselves, the gentleness of God's love will help us to forget about ourselves. The more we do this, the less we will sin because we have begun to forget about our arrogant selves in favor of God. In this is revealed another truth, simple to say but very hard to really learn: the way to stop sinning is not by trying not to sin, but by letting ourselves fall in love with God. Love is always liberating because it pushes us into falling out of ourselves and into another. Because He is eternal, infinite, and a superabundant Love, falling in love with God is the most liberating thing of all. O aeternum et inaccessibile, clarum et dulce profluvium fontis absconditi ab oculis omnium mortalium. "O eternal and unapproachable, bright and sweet flow from the source hidden from all mortal eyes." Surge igitur, amica Christi, esto sicut columba nidificans in summo ore foraminis, ibi ut passer inveniens domum, vigilare non cesses, ibi tamquam turtur casti amoris pullos absconde, ibi os appone, ut haurias aquas de fontibus Salvatoris. "Rise, then, friend of Christ, like the dove that nests in the high mouth of the cliff, (Jeremiah 48) as the sparrow that finds a home, (Psalm 84) like the turtledove hiding the chicks of her chaste love do not cease to watch, then put your mouth [to the flow] that you might drink from the wells of salvation. (Isaiah 12)"
What a beautiful model of prayer for today! Sometimes when little kids get hurt their mothers kiss the wound to 'make it better.' With Jesus it is the other way around. When we kiss his wounds, we are healed. As always, translation improvements are welcome in the comments. In you charity, and especially in light of the hypothetical I used in yesterday's post, please offer a prayer for the young woman who jumped from the Tappan Zee Bridge last night, and for the consolation of her family. Today is a great example of why silent prayer is critical for me. I go to Morning Prayer and Mass. In between someone gives me another farewell card. Inside is a note addressed to God, not to me. "Please bring him back to us." What feelings that brings up! But I can't be distracted by any of that. I have to get myself recollected for Mass. I'm a sinner with no right to approach the Lord's altar as a communicant, and still less as a priest. What goodness and kindness I have been able to facilitate here I refer to God; all that pertains to me are my faults and sins. After Mass I go back to my room, where I am greeted by phone messages that detail the various technological problems people are going through. There's some kind of encryption problem with one of the wireless signals. The office network connection still seems to be locked out of all Google products and services. Someone's voicemail is locked up and needs to be reset. Temptations to vainglory give way to the temptation to self-pity. Why is it my responsibility to deal with every technological problem anyone might have? (I know why; it's because I'm the youngest.) Can't I just get started on the reading and writing I wanted to do this morning without running around putting out fires? This isn't why I joined the Order! This last thought is the most dangerous. I joined the Order because I became confident that I could find the will of God for me in obedience to the brothers. That is where I am to find my consecration each day; not in my idea of being a friar. How wise St. Bonaventure was when he said that the hardest poverty was for a brother to let go of the "money bag of his own opinions." This is why I have to pray. It's practice in letting go of thoughts and feelings in favor of the intention of loving God alone. The alternative is to go through the day thrown this way and that by every inclination of my selfish heart. By spending what time I can in quiet prayer each morning, with my intention of turning heart and will to God alone, I practice this skill for when it really counts during the day. It's the beginning of my freedom from the tyranny of self, from the tedium of living with my own shallow heart and mind, the taste of the final surrender of heaven. Assuming that God is the God of the Judeo-Christian-Islamic tradition (which is to say both omniscient and omnipotent), can He create an object so heavy that He can't lift it? If the answer be 'yes' (because God can create anything), than God cannot be omnipotent because He cannot then move the object; and if the answer be 'no' (because God can move anything), than God cannot be omnioptent because He Cannot create such an object. It follows logically that since God is not omnipotent, He is not God. Of course this is not a new problem. I doubt that my response--I dare not call it an answer--will satisfy atheists, and perhaps it will satisfy believers still less. It's hardly even satisfying to me and involves theological questions within which I am still searching myself (thank God!) So if you think you will be annoyed by an unsatisfying answer, stop reading now. I suspect that the presentation of this problem does not produce many sudden conversions to atheism. Perhaps more often it causes the discomfort of doubt or the increase of questioning. Neither of these are enemies of faith, however, but friends that are hard to recognize. I suspect an atheist reacts in a similar way when presented with something like St. Anselm's "Ontological Argument" for the existence of God. I have heard of a few conversions, but mostly the simple inability to find fault with the logic does not induce conversion. My simple answer--and here is where it will become unsatisfying--is that God's omnipotence just doesn't work like that. Let's say that later on today I allow my own fatigue and the despair I bring upon myself with my sins to overwhelm me. I drive my car up the Saw Mill Parkway to the Tappan Zee Bridge, park in the middle, and jump off. What will happen? Surely it is God's will that I live and flourish and be happy, but all of that will be over as I hit the water and die. So, at least on the spiritual level, God has made an object (me) so heavy that he cannot, or at least will not, lift it to safety. This is exactly why St. Paul called Christ crucified a scandal to Jews (i.e. believers) and an absurdity to Greeks (i.e. believers in human wisdom.) And it remains so. Believers are annoyed to hear about the God of Jesus Christ who, apparently, refuses to control the world or intervene in the suffering we bring upon ourselves in anything like a heavy-handed way. Atheists--and this is the logical force of the conundrum--complain that this God doesn't seem very intelligible as a deity. What does it mean to say that the omnipotent God is revealed as a condemned and tortured criminal in the midst of his execution, not being able to move his hands and feet, much less lift infinitely heavy objects? It means, at least, that omnipotence and almighty-ness as divine attributes are not exactly what they are supposed to mean, prima facie, to us human beings. Nevertheless, I am lifted up. When I received Holy Communion this morning, that same Christ crucified continued to unite himself to me precisely in my own brokenness and the misery, despair, and confusion I have brought upon myself with my sins. It's not that Christ has taken me, an infinitely offensive and heavy object, and lifted me up from above, but that he has pushed me up from below by descending into my powerlessness and weakness. With the strength of knowing this salvation, I will not have to struggle this afternoon with the temptation to jump off the Tappan Zee Bridge. And it is my prayer and hope that it also gives me the strength to avoid all of the other little suicides of sin. Please follow this link for a follow-up post. On Saturday I did my last wedding here at the parish. As I was cleaning up from the ceremony, I got a little emotional for a moment; I think it was the beginning of my grieving for my assignment coming to an end. In my three years as a parish priest, I have witnessed twenty-six marriages, and prepared about five more that were witnessed by guest clergy. It's been a big part of my life. At one point marriage preparation envelopes were the largest single thing in my office file drawer. In the middle of my time here I had seventeen couples on my checklist spreadsheet for paperwork and stages of the process. Now the spreadsheet is empty. No more calls to check in and remind brides about paperwork or evenings in the parlor reviewing the "FOCCUS" instrument. I'm very grateful for having had the opportunity to work with all of these folks, and for the privilege of witnessing their mutual offering to one another in the sacrament of marriage. Preaching at weddings has helped me to understand certain things more clearly, truths that apply just as much to the vows of religious consecration. When you begin to touch the very eternity of God, whether by falling in love with another human being or by the prayerful solitude in which a call to celibate consecration begins to emerge, that very eternity demands a commensurate response. The only imitation that will satisfy in this life is to say "forever." This is why love pushes us into permanent commitment; it's the least we can do, the least that will satisfy us. It's why two kids who know nothing of permanence and much less of eternity can write 'together for ever' on the wall; they have experienced the love that is God himself translated into our experience, and God's eternity pushes them to say such a thing even though they don't even know what it means. Our freedom does not consist in preserving the false liberty of always keeping our options open, wandering through life and refusing to land, but in the freedom to dispose of ourselves fully and completely. Of course I knew this before on the cognitive, theological level, but those whose marriages I have witnessed over the past three years have taught it to me at the deeper level of the heart. Thank you. This is going to be one crowded guest room! Today was one of those Sundays when I only realized what I wanted to preach at the last minute. Without enough time to put it together in my head, and with the distraction--for me and the people--of our new pet pigeons flying about the church, it was kind of a mess. But here's the thing, why the Mass is such a big deal. It's not enough for God just to save us, or even just to save us through the Passion and death of his Son. God wants us to be involved, to participate in, perpetuate, and multiply salvation in the world. This is why Jesus institutes the memorial of his own sacrifice in the bread and wine of the Last Supper, to extend his saving work forward in time, in such a way that is accessible for us. He doesn't just save us, but offers us a way to join ourselves to the salvation, to unite ourselves to the sacrifice of Christ and thus be transformed into the heirs of his mission as his risen Body. This is the error of those outside the apostolic Churches who say that they don't need the Eucharist; Jesus died on the Cross once for all, the sacrifice is over, and all you have to do is assent to the salvation that was won for you. Yes, Jesus died on the Cross once for all. Yes, the sacrifice is accomplished and completed. Yes, salvation has already been won. But everything about the mystery of Christ, suggests that God wants to go beyond simply saving us from a distance; he wants to embed his salvation in our humanity. Those who deny the Eucharist and disregard the perpetuating nature of the passion, death, and resurrection of the Lord within it fail to take the Incarnation seriously. That's the point. The one sacrifice is extended through time in the Mass to give us a way into it, and it a way into us. The Word became flesh so that we, in our flesh, might too become bearers of the Word. Follow this link for my homily for this weekend, in which is touched upon the good news of the institution of the Eucharist, the meaning of 'conscious and active participation' at Mass, and the mission of imitating the mystery we receive. [T]hose who are most importunate in asking for them are the slowest to return them; books return torn and dirty; he to whom they are lent, lends them to another without your permission, and this other sometimes to a third, and this third not knowing by now who owns the book is not in a position to give it back; sometimes again he to whom a book is lent leaves the place and is then too far away to bring it back; and if he manages to find someone to bring it back for him, this someone wants to read it before giving it back, or lends it, and ends up by denying that he ever had it; finally if a book is lent to one man others are angry that it is not lent to them too, so that one is forced to do without it oneself while waiting for it to come back dirty, or be lost altogether." Bonaventure, Determinationes quaestionum, II, 21, as quoted in Etienne Gilson, The Philosophy of St. Bonaventure, trans. Dom Illtyd Trethowan, 61-62. One of the networks which I use has developed an unwillingness to load Google products, which includes Blogger. For this reason, comment publishing may be slow for a while. Thank you for your patience. "When you're in love with someone, you look forward to opportunities to give a gift or do something extra for that person. Birthdays, anniversaries, and other special occasions provide moments for people to express their love in a special or extraordinary way. In our relationship with God, these special occasions are called temptations." Dear St. Charles, you were martyred, at least in part, for refusing to accept a situation of sexual abuse. Pray for our bishops and priests, and for all of us who serve in the Church, that we might have the same zeal and resistance, as well as the courage to name the sicknesses and immaturities in our own culture. Pray for the people of Uganda, for all African people throughout the world. By your intercession, may all people seek the true peace based in justice. May God help us all to desire and work for reparation and reconciliation for all the injustices bequeathed us by our ancestors. Last of all, pray for me, Brother Charles of New Haven, friar of the Capuchin Franciscan Order, that I--having already wasted enough time to merit hell--may finally consent to the grace to make a beginning of a spiritual life. "I remind you to stir into flame the gift of God that you have through the imposition of my hands." I find that so encouraging, because it suggests to me that there is something to stir! A priest once told me that I "seemed to have a desire for prayer." I almost cried, it was such a beautiful compliment. But I don't always feel like I'm on fire with that desire for God, or even furnished with enough fervor to get through the day with what feels like adequate devotion. St. Paul's words remind me that even when I don't perceive in myself much of a fire for God, my religious life, or my priesthood, the fire is still there, smoldering quietly. It is my free choice whether or not I can surrender to God or consent to his grace enough on any particular day to have the embers stirred into flame. But the fire of desire for God is still there no matter what, because God has made us that way. The Church's liturgy has norms and options. It's amazing to me that they are often treated in reverse; to ignore or transgress norms is often overlooked or even praised, but to question the use of certain options is unimaginable. It's backwards. On the other hand, while it's o.k. and even praised to ignore norms, it's not o.k. to question certain options. In some cases, one may not even raise a question about how certain options seem to have hardened into unassailable norms; e.g. the offering of Mass versus populum or in translation, or of replacing the actual texts of the Mass with songs and metrical hymns. These options for the celebration of Mass have become such de facto norms that a lot of people, including priests, don't remember that they are options and might not even believe you when you tell them. Maybe you just want to explore the tradition in a spirit of innocent curiosity, but soon you will earn for yourself various unpleasant labels. Caedmon's comment on this post reminded me of my favorite late-for-church story. In one my parishes along the way, our pastor was always late. We used to joke about it; it was said that no matter how late you were for Mass, you were still probably early. And they were right. Thanks to everyone's devout support of Monsignor's (apparent) Lenten reform, the Mass on Friday started as late as ever. 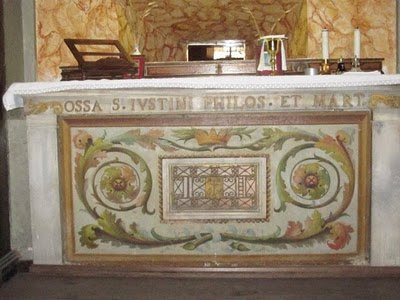 "The bones of St. Justin, philosopher and martyr"
On my first visit to the church, which--in good Franciscan style--is dedicated to the Immaculate Conception, I was pleasantly surprised to find Justin's relics; I had no idea that they were there. The poor church is so famous for our lovely bone chapels that other things get missed. Not that I don't like the bone chapels; they're a little macabre, for sure, but their particular art might be a good word against a world that has ceased to believe in the final destiny of the body. And that goes for you too, Catholics who cremate their relatives and then refuse to give them a proper burial. St. Justin and I have a long history. When I was preparing for baptism I had to choose my Christian name. I looked through a list of patron saints. I was a philosophy student at the time, so I remarked on Justin as the patron of philosophers. I went to the library and read the First Apology and the Dialogue with Trypho. I found them fascinating. I still use Justin's description of the Eucharist whenever I train or give a talk to ministers of Holy Communion. In an uncharacteristic display of practical wisdom, I decided to leave Justin and be baptized with the same name I had before. Nevertheless, I have come to believe that my choice of Charles Lwanga as a baptismal name was pure Providence. It only started to become clear to me later. Justin came up again as a candidate at my Confirmation, but lost out to St. Joseph. Because of his presence in these discernments, and because he was someone I read very early on, I have always considered St. Justin to be something like a tertiary patron saint. Whenever I try to pray for our brothers in studies, I ask Justin's prayers as well.